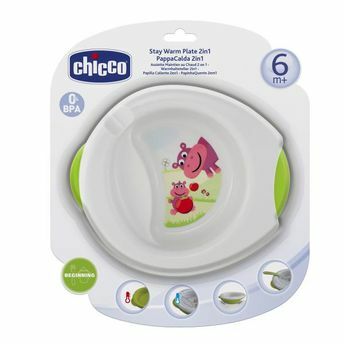 The Stay Warm Plate by Chicco keeps you calm while feeding your baby, without having to worry about the food getting cold. The smaller plate, due to the presence of a warmer, can be filled with warm water, helping to keep the meal warm for longer. With the larger plate, the meal can be quickly cooled thanks to the special cooling section. The detailed making of the plate makes it really easy and convenient to use. Mothers now you can make mealtimes more peaceful than ever!